Browsing articles in "Burning Man Related"
First up: the link – this is VERY important! the link to purchase tickets! Midsummer’s Flux tix. 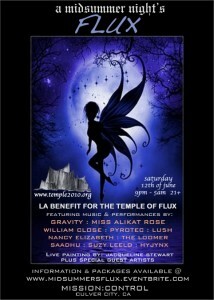 Tickets must be purchased online ahead of time, no buying at door due to LAPD! Since 2000, the Temple has been a place for catharsis, remembrance, and rebirth, offering Burning Man participants a physical reminder to embrace change. Drawing its inspiration from canyons carved over time by wind and water, the Temple of Flux rises from the desert floor as a series of graceful double-curved walls. Their wide, heavy bases taper as they ascend, leading the eye from a solid urban foundation to an increasingly fragmented upper edge as these long angles reach to the sky. Please be quiet in the neighborhood, respect your surroundings, and do not post to lists. Parking & venue information will be sent to you along with your donation receipt. Drink tickets will be available for purchase online at the venue.